Some home security systems can be customized to allow entry to some people and to bar others. Suppose this customization is done wrong, granting entry to robbers. We will end up plundered. A similar robbery happens in our inner world wherein our conscience is like our internal security device. Its settings are based on our past impressions – our upbringing, education, association and overall culture. Based on those settings, it guides us to see certain things as right and certain things as wrong. Whenever anything wrong tempts us, our conscience rings an alarm within us, actuating us to resist it. But suppose we indulge in something wrong repeatedly. The more we indulge in it, the more our conscience becomes desensitized to its wrongness. Not only do we do wrong, but we also stop feeling that it is wrong and stop trying to stop ourselves from doing it. 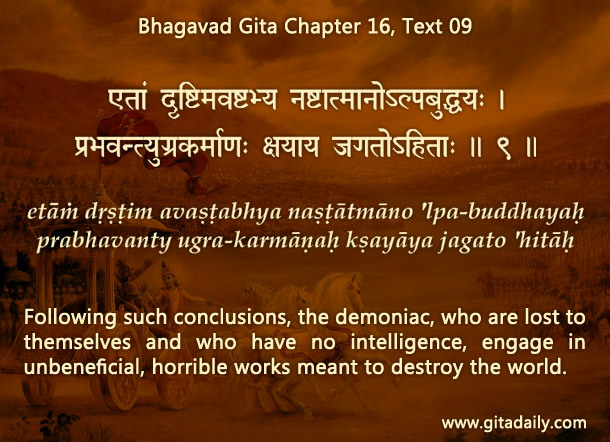 Such ethical distortion can become so catastrophic that some ungodly people can even delight in deadly activities (Bhagavad-gita 16.09). Phrased in the security device terminology, repeated wrongdoings customize our conscience to not raise an alarm on encountering wrong desires. Thus, desires meant to be disallowed are allowed. Such self-defeating customization often happens subtly and sinisterly in today’s culture wherein immoral indulgences are often considered not just normal, but even glamorous, thereby distorting our ethical compass. To protect ourselves, we need to study scripture regularly. Such study reminds us of right and wrong, equipping us to evaluate and correct our conscience’s settings. Thereafter, if we start getting tempted to something that scripture reminds us is wrong, then our conscience starts getting activated, even if we have been doing it habitually. Being thus alerted, we use our intelligence, willpower, and ultimately our devotion, to resist that unhealthy choice and make a healthier choice.